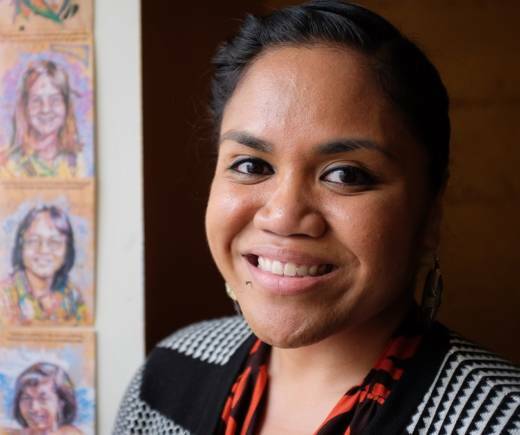 Terisa Siagatonu is a poet and mental health advocate who works with young people. She grew up in San Francisco, but her family is from Samoa, in the Pacific Islands. She says to be from Samoa is to be from water, and that this belonging with water is shifting because of climate change. We talked to her for our series, This Moment on Earth, about how climate change has impacted people's lives in personal and specific ways. This is Terisa Siagatonu's Moment. Water, for me, equates to belonging, or the sense of belonging, the sense of home. Because I know my home and my homeland is in the water. But the water is also a threat. There's now such a thing as a climate change refugee, and I see that amongst my community of folks having to leave where they're living, because the sea levels are rising and they literally cannot survive. It's hard to imagine being hopeful when you know that there are very real things happening to the place that you're from. I imagine having children one day and wondering, can I bring them with me to visit Samoa? Will it still be there or will it be underwater? Will the only things I have to understand my culture and my identity be the books that my grandpa wrote, and the limited knowledge I have from what was passed down to me? And so, I get really scared. I get really nervous about what legacy will be left for future generations in my community. I think the poet is responsible for making what is typically taboo or typically off-limits to talk about -- make it to make it possible to talk about, and make it accessible. Especially right now in regards to climate change -- I see poetry, I see it literally as medicine. Terisa Siagatonu is an award-winning poet, teaching artist, mental health educator, and community leader born and rooted in the Bay Area. A queer Samoan woman and activist, Siagatonu has spoken and performed at the White House and the UN Conference on Climate Change in Paris. In 2012, she received President Obama’s Champion of Change Award for her activism as a spoken word poet/organizer in her Pacific Islander community. Her Moment was recorded and produced by Peter Arcuni and Becky Hoag.